About 10 years ago I took a trip to Hawaii with my husband and kids and stepped on a sea urchin as I clambered out of a kayak onto a rock. The pain was excruciating and I spent the next several days not enjoying the gorgeous sights of the Big Island, but soaking my foot in salt and vinegar and googling "sea urchin." The strange thing is that pretty soon afterwards, I didn't regret what had happened, but accepted it as part of what made this trip especially intense, vivid, and memorable. When bad things happen, why don't we regret them? I heard an interesting talk on this question at the Rocky Mountain Ethics Congress a few weeks ago--the speaker was Camil Golub, a philosophy PhD candidate at NYU. He skillfully canvassed a multitude of possible explanations, and settled on the idea that these kinds of bad-but-not-regretted events become a part of our biographical identity. This isn't supposed to be a metaphysical concept--the idea isn't that I became a whole new person when I stepped on the sea urchin. Rather, in some looser sense, bad things can alter who we are, so that we can't distance ourselves from them without distancing ourselves from ourselves. So we say we're glad these things happened, or at least don't regret that they happened. This doesn't stop them from being bad things. I highly advise all people to avoid stepping on sea urchins--it's excruciating and the resulting problems will absorb your attention for weeks to come. However, if you do step on one, it's quite possible you won't regret it. That's a strange combination of assertions, but the biographical identity account makes pretty good sense of why a reasonable person might have that set of attitudes. 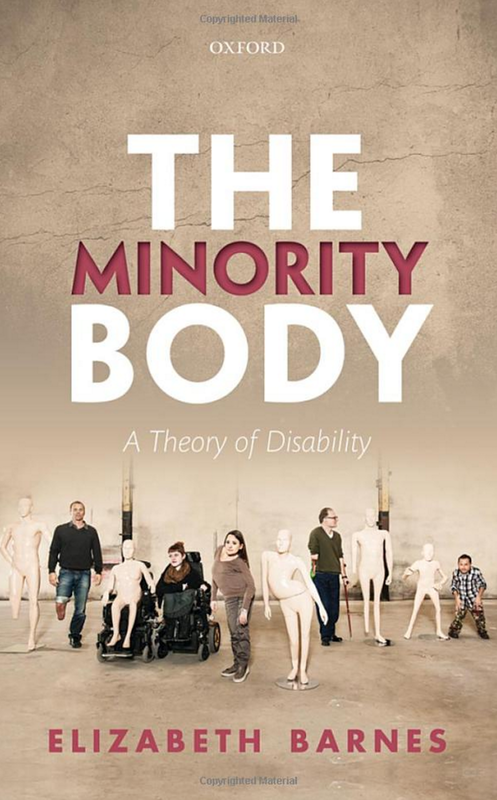 I found myself thinking about the sea urchin story and unregretted bad things while reading Elizabeth Barnes's new book about disabilities, The Minority Body. Barnes claims that disabilities (physical ones--she doesn't talk about mental disabilities) are mere differences, as opposed to being bad differences or good differences. According to her, being blind, deaf, paraplegic, and so on, are akin to being gay or being male. It's value-neutral whether you're gay or straight, value-neutral whether you're male or female, she says, and it's likewise value-neutral whether you're blind or sighted, deaf or hearing, paraplegic or walking. Golub said nothing about disabilities in his talk, but I'm inclined to think perhaps he gives us the tools to think about this more coherently. Being blind is a bad thing some people might not regret, like my vastly more minor encounter with the sea urchin. Reason: bad things sometimes become woven into our biographical identity. You can't wish they had been otherwise without wishing yourself away. Barnes says no to that assessment. Being blind is a mere difference on her view, not a bad difference. One of the main arguments she makes is that the mere difference view accords with the testimony of disabled people themselves. She thinks we'd be doing these people a "testimonial injustice" if we insisted disabilities really are bad, even when they say otherwise. Take, for example, this recent letter to the editor of The New York Times. Erin Hawley says she wouldn't want her disability taken away, despite "the pain, the anxiety and breathing problems." Barnes calls these "local bads" and doesn't think they go to the heart of the matter. She wants to respect testimony like Hawley's and classify disability itself as a mere difference. But what is Hawley saying? Her testimony is compatible with construing her disability as an unregretted bad. In fact, even her language is quite reminiscent of "biographical identity" talk. "What I've experienced in life is a story worth telling, and road worth following, despite how society tries to tell us otherwise." This business of respecting testimony is tricky. Whose testimony counts? Almost all of the testimony Barnes cites comes from disability activists, and surely that would be the group most likely to see their disability in a positive light. I also wonder about the point in time when testimony is revealing, as testimony can change. In the initial stages of going blind or becoming paraplegic, a person can find the changes excruciating (as Barnes certainly admits, calling these "transition costs"). A few years ago I met a very young person who had suddenly and permanently became paraplegic--clearly a very, very hard thing for them to face. I'm pretty sure they weren't just distressed by the transition, but by the prospect of no longer walking, ever, and having other health problems. This person would have testified, at that time, that their disability was an extremely bad difference. It could be that later on they developed a more positive attitude, but I see no reason to regard the later positivity as superseding the earlier profound disappointment. I don't see that only one of these attitudes reveals The Truth about disabilities. Barnes complains that this testimony is ignored by people who regard disabilities as bad differences--she urges "taking their word for it" (a chapter title). 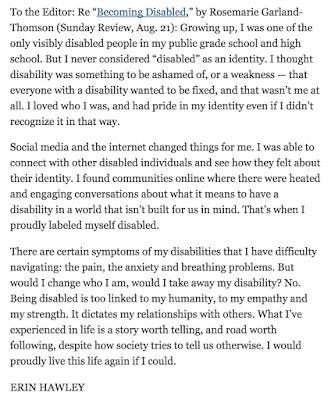 But taking this testimony at face value, you wouldn't just elevate disabilities from being bad differences to being mere differences, you'd elevate them to being good differences. That's what people are saying here--they value disabilities, as opposed to seeing them as neutral. Barnes seems to think she needs to go along with this, to solve the cancer puzzle, but in fact doesn't go along with it. She thinks it's not positively good to be paraplegic or blind or deaf, it's value-neutral. A philosophical theory about disabilities can't just take what people say and repeat it. If that was a sound methodology, what we'd surely have to say is that for some people disabilities are bad, for some neutral, and for some good. 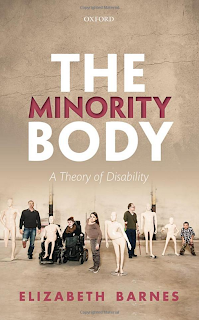 A theory is inevitably going to sift and interpret and take into account considerations that go beyond what's on the minds of disabled people themselves. But that being the case, I think the bad differences view is just as much in the running as the mere differences view; both are at odds with what some people say to express disability pride. In fact, I do think the bad differences view is the right view, but also think the concept of biographical identity supplements it helpfully. Disabilities often become a part of "who we are" and are not later regretted, but they are still bad, and to be avoided. Why are they bad? That's a big question I can't deal with in this blog post (I discuss it in chapter 6 of my book The Weight of Things). But here's one thought about the issue. Barnes points out that people with disabilities don't seem to self-report lower levels of well-being, in studies of happiness and life-satisfaction. She also complains about entrenched ableism, prejudice, and failure to accommodate. But this is odd--why such high well-being, if there's so much prejudice and failure to accommodate? One possibility is that all the prejudice and failure to accommodate must harm people, so that the studies of well-being are unreliable. But then perhaps they also don't tell us whether or not disabilities lower well-being. A third possibility is that people with disabilities have high levels of well-being, and this shows prejudice and failure to accommodate are value-neutral. Surely that's absurd. Likewise, we wouldn't be forced to say disabilities are value-neutral, even if it were true that they don't reduce well-being. I love music and I cannot imagine that becoming deaf with age (as occurred with my mother) is not wholly negative, a loss. In fact, ageing (I'm now 70) is a process of losing physical abilities. I walk a lot more slowly now than I want to. My sexual energy is diminished and I don't relish that. My eyes tire more easily when I read (in spite of glasses) and reading is very important to me. The list is long and I don't see anything positive about ageing except that I get a discount in the subway. I hate to be politically incorrect, but I think that there's a lot of sour grapes in all this stuff about apparently negative disabilities not really being negative. I've been reading about disabilities partly because I want to think about aging. Unfortunately, I agree with you about aging (I'm 60). Hate walking more slowly, getting tired eyes, looking for my glasses, etc. 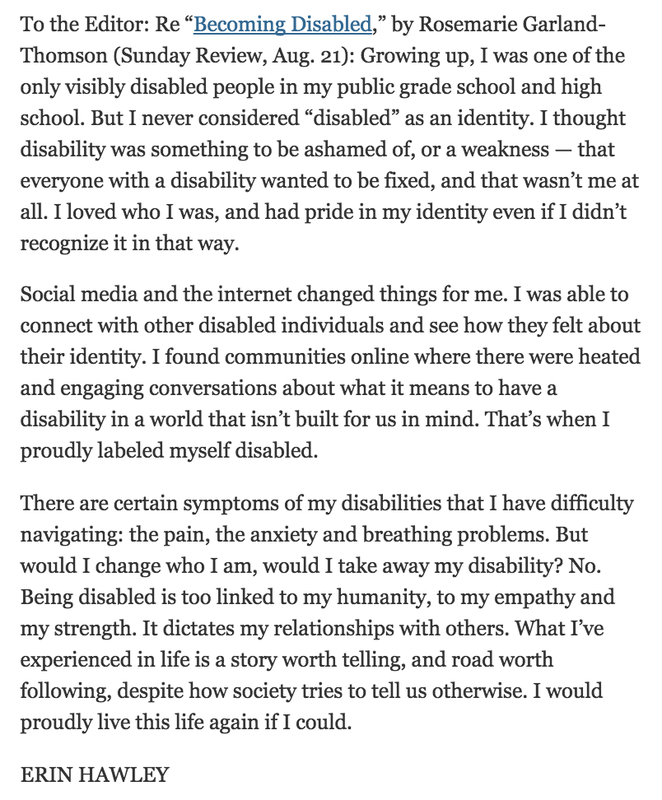 The irony is that I think problems have to be both more dire and more visible for people to start thinking of them as disabilities. At that point, an identity may form around a set of problems, and then (ironically) there's a possibility of treating them as neutral instead of negative, like Barnes says. It would be pretty odd if ordinary smallish disabilities that go with aging were simply bad, but big disabilities like blindness were "mere differences." I just can't buy it. Honestly, I think they're all bad, but fortunately people can extract some sort of meaning out of some of them--biographical identity or something of that sort. Not sure that's possible with the age-related stuff, but I'm not done thinking about it! As to the biographical identity stuff, maybe it's as Nietzsche says, "what doesn't kill me, makes me stronger". For example, it's winter here and I had bronquitis, which until age 70 is like a bad cold, but no, this year it was serious and I'm still coughing after a month, still feel weak and haven't returned to my normal diet. In any case, I'm recovering; and in some sense dealing with bronquitis during all of August is part of my biographical identity now. However, would I have happily incorporated a month of bronquitis into my biography if I weren't recovering from it, if it had left me with markedly diminished breathing capacity or would I be cursing God like Job? There's something very honest about the book of Job. Bad things do happen to us and when they do, if we're honest with ourselves, we see them as bad, as negative, unless (this is a big "unless") we recover from them.